Tumbleweed, one of the most prominent names in tiny houses, is hosting a two day workshop in Sacramento this weekend (February 21-22, 2015). The work shop is being held at the Holiday in Express at 2224 Auburn Blvd. This workshop will go from 9am to 5pm on Saturday. The Sunday sessions are from 9am until 3:30pm. 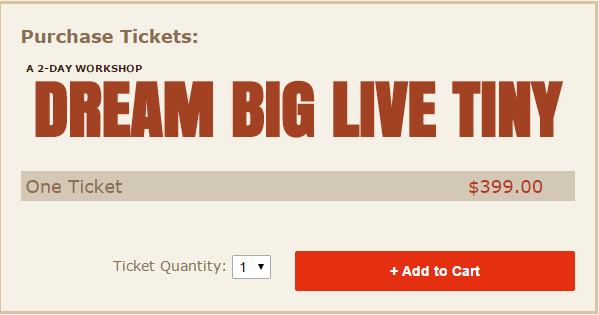 Tickets are selling for $399 each. If you are looking for discounts, view our Tumbleweed coupon page. Ella Jenkins is the host of the Sacramento workshop. Ella is uniquely qualified to host this event. She built her own tiny house after attending a Tumbleweed workshop in Los Angeles several years ago. She has a radiant attitude and genuine passion to help people achieve their tiny house goals. Before attending the workshop, she had never built anything. Transitioning to a tiny house allowed Ella to live the life she wanted. She now only works a couple weekends a month, and she lives close to the beach. Said more succinctly, the tiny house transition allowed her to regain her life. Tumbleweed workshops are the best way to advance your tiny house dreams in a short amount of time. The compact nature of the workshops makes it feel like work. It is fun work, but it is work. Your mind will be overflowing with information by the time you finish the weekend. It is highly recommended that you take notes. It is also useful for some people to write down your questions before attending. Few things are more disappointing than realizing you forgot to ask your most burning questions. Bring some granola bars or some sort of light snack for when your blood sugar gets low. The high cost of these workshops means that I can only recommend them to those who are serious about pursuing their tiny house dream. If you are less certain, search for local tiny house Meetups. Those meetings are typically free and have lots of good information. Tumbleweed sells plans and pre-built tiny houses. They have gone through the process to be a certified RV manufacture. This makes their tiny houses a great choice for those who expect to face permitting hassles in their community. RV’s have far fewer restrictions than permanent structures. Tumbleweed used to be associated with Jay Shafer, one of the biggest name in the sector. Their prices tend to be higher than newer upstarts, but customers can buy with confidence.